The architecturally groundbreaking community of Seaside straddles Scenic Highway 30A in Florida's Panhandle. Inspired by New England villages, its clapboard and gabled houses, none taller than a couple of stories, fan out from a village green bordered by shops and restaurants. Some cross the highway, filling the narrow defile between it and tall, undisturbed white-sand dunes. Most, however, spread northward into neighborhoods of houses with porches and white picket fences arrayed along narrow tree-lined streets. It's award-winning design by the architectural firm of Duany Plater-Zyberk & Company became a showcase for a movement called "New Urbanism," though it is probably best known these days as the setting for the 1998 movie "The Truman Show" starring Jim Carrey. Seaside's notoriety has made it one of the Panhandle's must-see tourist attractions, giving rise to carloads of gawking tourists and a bevy of shops that cater not so to residents and guests but to visitors. Back there, among some trees at the end of a sandy path, stands the unpretentious Seaside Swim & Tennis Center. 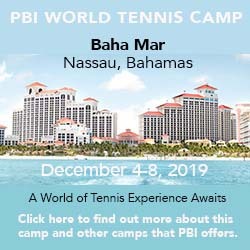 Tennis director Brad Pomeroy, who'd been an All-American on the University of North Carolina tennis team and then played futures and challengers for three years on the ATP Tour, heads the Seaside tennis program. On the schedule are adult and junior clinics, including a few sessions for PeeWees, as well as weekend and holiday round robins. "Our philosophy is to make sure that everyone gets to hit a lot of balls," he told me, "whether that's in a clinic or a round robin." The pro shop can also arrange matches, drawing on a stable of some 100 local tennis members. Courts & Fees. There are four clay and two hard courts adjacent to a croquet lawn, a playground with a sand floor, and two swimming pools, one for adults, one for families (the latter covered and heated in winter). Fitness Center. There is a modest fitness center with cardio and strength equipment and free weights and optional personal trainers. And ... There are three main pools, two of them heated in winter, as well as four other pools in various neighborhoods. Bike rentals are available as well. Camp Seaside for children 4-12 operates Monday-Thursday from late spring through summer. Lodging options range from an inn by the sea to cottages as large as six bedrooms. As befits a beach destination, there is a wide variety of food outlets, from ice cream and fudge to pizza and fine dining. Lodging choices range from a seaside inn to one-to-six-bedroom homes. So far, I haven't received any written feedback on Seaside. If you've taken a tennis vacation there, I'd like to hear your reactions.